REGISTER FOR CLASS ONLINE BEFORE YOU COME!!!! If you’re bringing a friend tonight post to the comment box, so we can get an idea of how big these evening classes are going to be! GRACIAS! 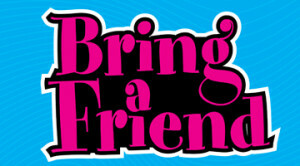 Bring a friend to any class today for a fun free WOD! Please have your friend create an account online to enter their info and agree to the online waiver before arriving. After they have entered info it will ask them to sign up for a class and pay. At that point they should log out. There is no option to sign up for class without paying so we’ll sign them in ourselves when they get here. Our friends from modPALEO are visiting us TONIGHT at 6:45! Join us for information and samples of delish local, paleo meals……and some beers. Want 15 minutes of fame?? News Channel 4 is visiting the 9 am class to record video footage for a segment on CrossFit.